Note: Please make sure you install the ThemetechMount Extras for Fixtech Theme plugin as this plugin is required for all below given shortcodes to execute. If you do not install this plugin, the shortcodes will not get executed. Click here to know more about how to install this plugin. 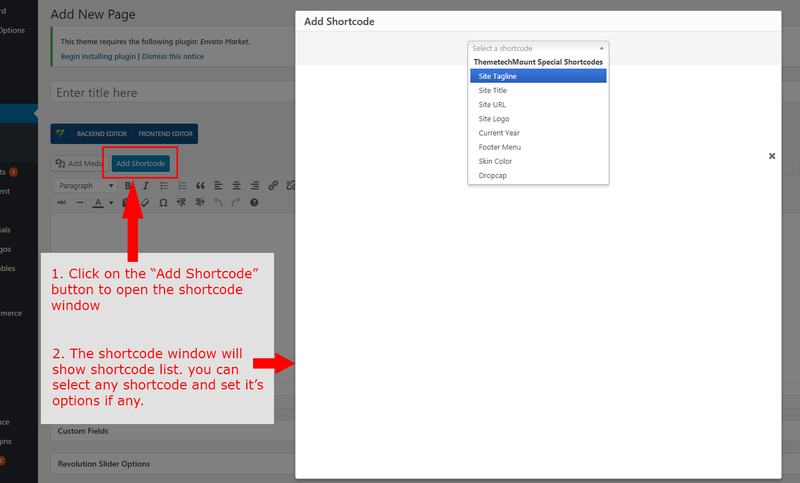 Here are list shortcodes with options in our theme. This shortcode will show the Site Tagline. There are no options for this shortcode. So just click Insert Shortcode button below to add this shortcode. This shortcode will show the Site Title. There are no options for this shortcode. So just click Insert Shortcode button below to add this shortcode. This shortcode will show the Site URL. There are no options for this shortcode. So just click Insert Shortcode button below to add this shortcode. This shortcode will show the Site Logo. There are no options for this shortcode. So just click Insert Shortcode button below to add this shortcode. This shortcode will show the Current Year. There are no options for this shortcode. So just click Insert Shortcode button below to add this shortcode. This shortcode will show the Footer Menu. There are no options for this shortcode. So just click Insert Shortcode button below to add this shortcode. Skin Color Text : Write text which will be appear with skin color. This will show text in dropcap style. color : This will add color to the text. bgcolor : This will add color to the background. Make sure you selected proper style.